What, you’ve never heard of a the Mills Busy Bee? Well maybe that’s because there is only one of them. It’s interesting to me how a company could build hundreds or even thousands of cars and only one or two (and sometimes zero) remain almost 100 years later. And here’s this thing – the only one constructed and it’s still around. I’ll bet this phenomenon has to do with the fact that J.A. Mills of Mansfield, England, built this car himself for his own personal use. In fact, it was his own personal driver from the time of its completion in 1920 until he died. It has covered over 100,000 miles! Then it was probably passed down or sold to someone who loves the unusual aspect of it. The original engine is long gone, but in 1928 the current 6 horsepower AJS V-twin was installed. The body is plywood and held on with only 10 bolts. It seats one and has a three-speed transmission that drives the lone rear wheel. It’s a lot like a Morgan of the time. It’s also likely the only shot you’ll ever have at owning this. H&H estimates a selling price between $16,000-$19,000. Click here for more info and here for the rest of H&H’s October 30th lineup. 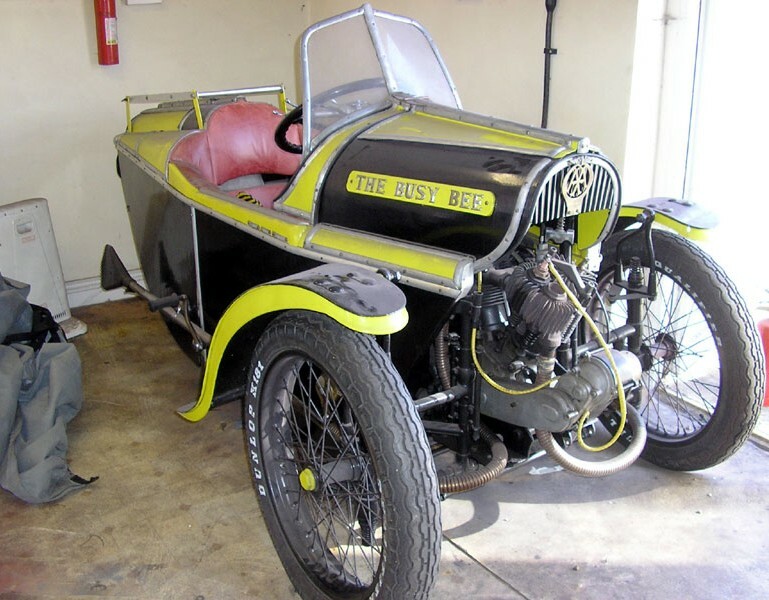 This entry was posted in Uncategorized and tagged 1919, auctions, busy bee, cars, classic cars, h&h auctions, mills, three-wheeler by classiccarweekly. Bookmark the permalink.